It’s almost always a treat to photograph a Max Factory figure, except when they get tossed in the bargain bin shortly after I pay full price for them. Resentment aside, they very rarely disappoint, and it’s particularly appealing when they produce a figure of a character who hasn’t received many figures prior. Such is the case with Mea Kurosaki, and that circumstance is a bit strange considering how popular To Love-Ru is and how attractive and well-known its female cast is. Nonetheless, it’s great to see her getting a figure, particularly when it looks as nice as this one does. Despite its age, Lineage II has been a popular source of inspiration for figure manufacturers. Thus far, Good Smile Company, Orchid Seed, and Max Factory have made figures of its characters. That’s gratifying to see, as Lineage II has some very attractive character designs. It’s not atypical in that respect; this may be over-generalizing, but I’ve long thought that Korean MMOs – a group that also includes TERA, Aion, Blade & Soul, and Scarlet Blade Online – have some of the best character designs in video games. The Kamael is the latest such figure to be released, and it’s the third Lineage figure to be produced by Max Factory; we’ll be looking at them in reverse order. Sometimes, I buy figures because I like the character, or because I like the series or game that she comes from. Those figures tend to be the most meaningful to me, but that’s not to say that familiarity automatically elevates a figure in my esteem. As an example in counterpoint, I know a bit about Saber, I’m a fan of Saber’s personality and I have a ton of Saber figures, but while I like them, I wouldn’t really describe any of them as treasures of my collection, aside maybe from gangsta lean Saber, and that’s mainly because she looks so damn peculiar. (Speaking of Saber figures, I’ve got that one with the motorbike still boxed up in my closet, where it’s been sitting for around 17 or 18 months.) Also, that’s not to say that not knowing much about a character means that I view it with less warmth than would otherwise be the case – even if I loathe the game or show that she stars in. Indeed, if the figure looks really cool, unfamiliarity is no impediment to appreciation. Which brings us to this figure of Kuroyukihime, a cute girl from a show I disliked so much that I dropped it fifteen minutes into its first episode. Despite my contempt for Accel World – or at least, its anime adaptation – I was very much looking forward to this figure. It’s not hard to see why. The schoolgirl-with-weapons theme is a very popular one, so much so that it’s made its way into Hollywood films like Kill Bill and Sucker Punch. Still, it is a quintessential theme associated with pop Japanese culture, particularly anime and video games, and as such one of the most common weapons for such a schoolgirl is a traditional Japanese sword. 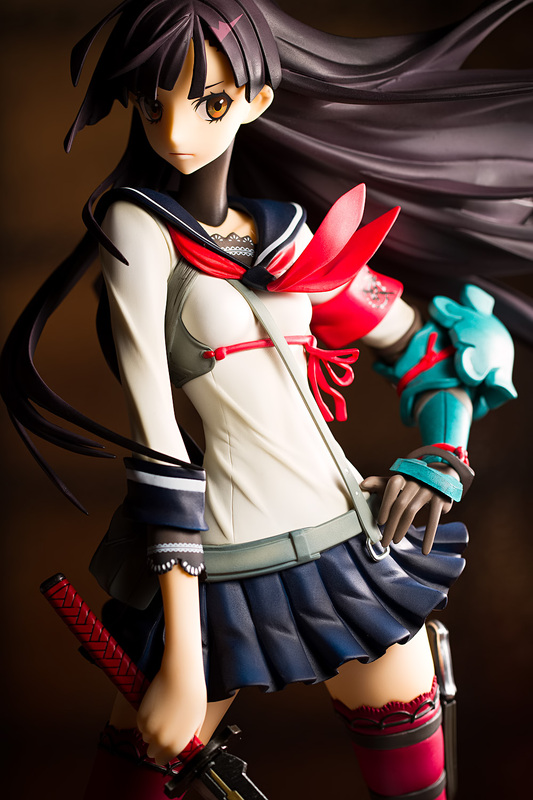 It’s odd, then, that looking at my collection, I see I’ve only got a couple of figures of schoolgirls with swords. This one here is one of them. Cognizant of the fact that well-known titles move more merchandise, most figure companies make figures of characters from licensed properties. However, Max Factory took a rather unusual approach with their figures of the se.Kirara characters; rather than seek out an existing franchise, they developed the title themselves, making them (to my knowledge) the only figure maker to also be an eroge producer. Another unusual thing about their strategy is that Max Factory released the game for free; unfortunately, while it was originally downloadable from the Nico Nico website, it seems to no longer be available. However, even if we can’t enjoy the game, we can at least admire the figures. The first to be released was Aya Kagura, who I actually have – somewhere around here – but we’ll be taking a look at the blue-headed Izumi Shizuno first. I have to admit that lately, I haven’t been too enthusiastic about Good Smile Company’s or Alter’s figure lineups. It doesn’t take any extraordinary talent at prognostication to look at a seasonal anime chart and guess which shows are going to get Good Smile Company figures and lately, Alter’s been eminently predictable as well. Unfortunately – for me, specifically – many of the characters they make figures of don’t interest me or come from shows that I don’t know much about. That leaves Max Factory in the role of the eclectic scale-size figure maker. They’re not nearly as capricious as, say, Daiki Kougyou or Yamato, but well, when one tires of buying Nanoha or Vocaloid or Strike Witches figures, one takes what one can get. 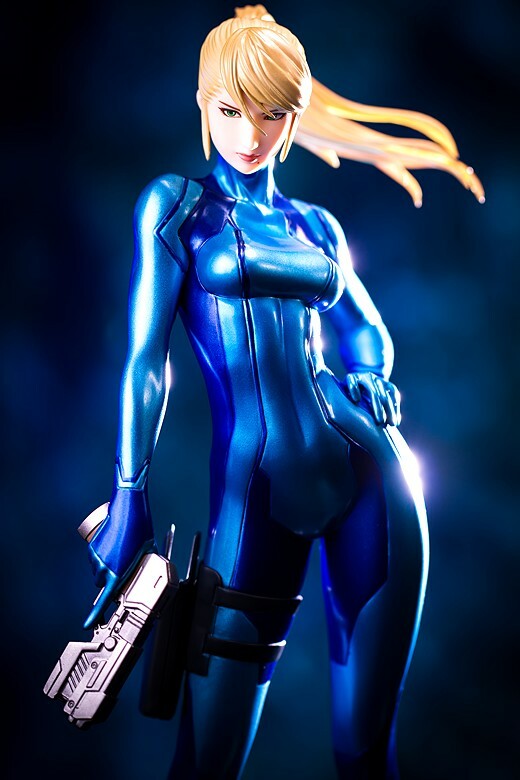 Fortunately, Samus Aran surely doesn’t count as a compromise. Miku Hatsune’s popularity among figure collectors is ascendant, and though it seemed like she would have to share the 2011 hobby spotlight with Tamaki Kousaka and Super Sonico, most of Sonico’s figures won’t be coming out until next year and many of this year’s Tamaki figures are manifestly forgettable, leaving no competition to contest Miku’s prominence. From her humble origin as an image character of a niche software package, she has become a titan of commercialization, appearing not only in her own games but also games such as Pangya Fantasy Golf and the PlayStation 3 port of Idolmaster 2, becoming the mascot of Good Smile Racing, and selling Toyota automobiles. And of course, she’s gotten figures – not just numerous figures, but a numerous variety of figures. A few years ago, one could justifiably complain that Miku figures all looked alike – Good Smile Company’s Miku looked very much like Volks’s Miku which looked very much like Max Factory’s Miku. However, in recent times, figure makers have offered new takes on the Vocaloid mascot, casting her as a sort of warrior clad in robotic armor and as a pit crew worker. Even more conventional takes on the character, such as Good Smile Company’s Lat-type figure and Max Factory’s Tony Taka-designed figure present distinctive poses and facial expressions. 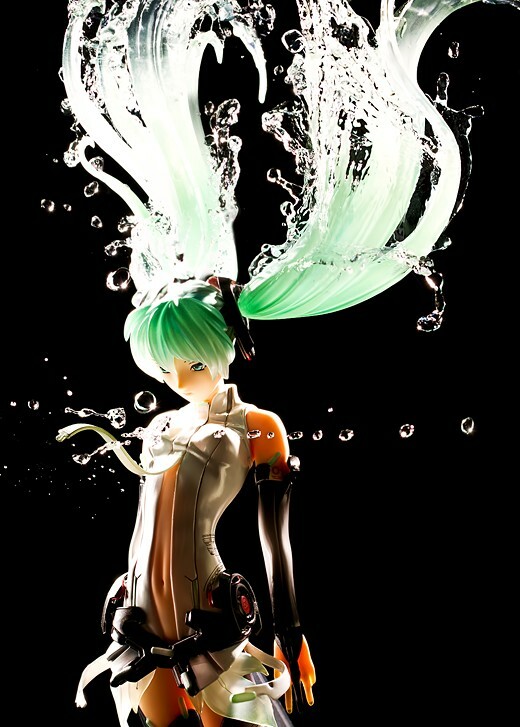 The latest Miku figure to be released is perhaps the most distinctive yet, but whether that’s a good thing is debatable. Let’s take a closer look at it. Here we have a figure from Amagami SS, a school romance show featuring a male lead who sleeps in a closet. Ordinarily, I’d rather have nothing to do with a harem-based school romance show, given how bad Princess Lover! was and how bad Mayo Chiki! 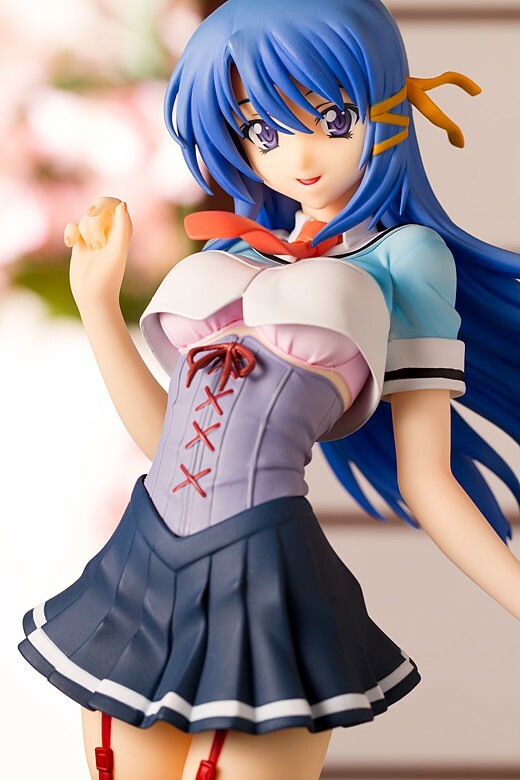 is looking to be, but one guess should suffice to divine what aspect of this figure enticed me enough to buy it.